McMurdo – The NZ MEOSAR satellite system builder is releasing the new G8 float-free EPIRB. 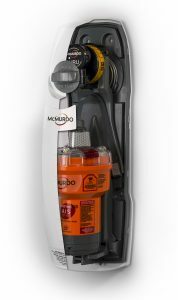 McMurdo, the provider of the entire MEOSAR infrastructure for New Zealand and Australia have developed a new generation of G8 float-free EPIRB. McMurdo developed the G8 range alongside MEOSAR in order to achieve the fastest and the most accurate solution for NZ mariners. Float-free EPIRBs or Emergency Position Indicating Radio Beacons are supplied inside an auto-housing and automatically deployed when in contact with water (they can also be manually activated). As a world’s first, McMurdo is also offering a combined EPIRB and AIS unit that will maximise the chance for a quick rescue by alerting any AIS receiving vessel in the area as well as the Rescue Coordination Centre in Wellington. The Ministry of Transport has introduced new regulations in March requiring all commercial fishing vessels over 7.5m operating outside enclosed waters to carry an automatically deployed or “Auto Float Free” EPIRB (SOLAS Category 1) by 1 January 2019. A list of McMurdo dealers and further product information is available from Absolute Marine. www.absolutemarine.co.nz , info@absolutemarine.co.nz, ph. 09 273 9273.